Winnipeg, MB (January 9, 2019): Taking its title from a phrase uttered by Manitoba’s illustrious Premier, Sir Rodmond Roblin, during a heated exchange with Nellie McClung, “Nice Women Don’t Want the Vote” is an exhibition that was developed by the Manitoba Museum to commemorate the 100th Anniversary of Manitoba women winning the right to vote on January 28, 1916. The exhibition opened at the Manitoba Museum in 2015 and has since travelled to locations throughout Manitoba as well as Saskatchewan, Ontario, and Quebec including the Canadian Museum of History in Gatineau and has been enjoyed by more than 70,000 visitors. The Manitoba Legislature will host the exhibition as its final venue, offering Manitobans a final opportunity to celebrate this important landmark in Canadian history. “Nice Women Don’t Want the Vote” will run from January 8 to March 31, 2019, is free to the public, and accessible when the Legislative Building is open. “The exhibit outlines the causes, the contradictions, and the people involved in the Suffragist movement, emphasizing the fact that suffragists wanted real power in order to change society. 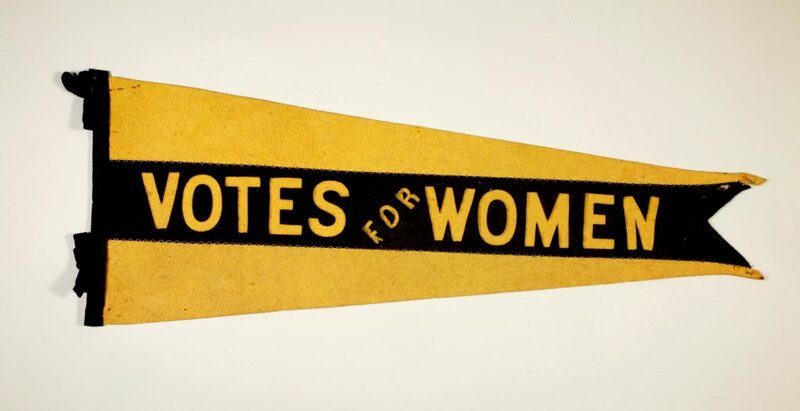 ‘Nice Women Don’t Want the Vote’ includes fascinating artifacts that prove that this was a real fight that had been brewing for 25 years, while also revealing the tensions within the movement,” says Dr. Roland Sawatzky, Curator of History at the Manitoba Museum. Through artifacts and photographs, the exhibit also explains why some Canadians, like Indigenous people and immigrants, were often left out of the discussion. Special thanks to the Honorary Patron, The Honourable Janice Filmon, CM, OM, Lieutenant Governor of Manitoba; and the sponsors, the Government of Canada, Wawanesa Insurance, Marion Kaffka, the Province of Manitoba, Winnipeg Free Press, and The Nellie McClung Foundation. The Manitoba Museum is located on Treaty 1 land, and the homeland of the Métis Nation. These lands, occupied for thousands of years, are the traditional territories of the Anishinaabeg, Ininiwak, and Nakota Nations. The Museum is committed to collaborating with all Indigenous peoples of this province including the Dakota, Anishininiwak, Dene, and Inuit. We acknowledge the harms of the past, are committed to improving relationships in the spirit of reconciliation, and appreciate the opportunity to live and learn on these traditional lands in mutual respect. Manitoba Museum is accredited by Imagine Canada for excellence in non-profit accountability, transparency and governance.